"Are any herbs safe, effective, and suitable for self-treatment? The Honest Herbal answers this question with clear, concise, authoritative information backed by scientific references readers can check for themselves. 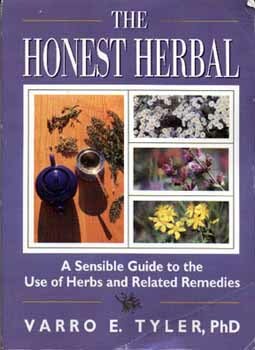 EVERYONE CONTEMPLATING THE USE OF AN HERBAL REMEDY SHOULD READ THIS BOOK FIRST." HERE IS THE LEADING AUTHORITATIVE SOURCE OF INFORMATION REGARDING THE EFFICACY AND SAFETY OF HERBAL MEDICINE.... It is refreshing to learn the truth about the value of herbs.... Essential for anyone taking or contemplating herbs for self-medication! The honest assessment of one of America's leading natural products scientists and one of the leading advocates of the rational, safe, and effective use of herbs as drugs.... YOU ARE BEST ADVISED TO HAVE THIS BOOK AND REFER TO IT OFTEN. The Honest Herbal is exactly that -- the honest assessment of one of America's leading natural products scientists, and one of the leading advocates of the rational, safe, and effective use of herbs as drugs.... IF YOU ARE INVOLVED IN ANY ASPECT OF HERB USE FOR HEALTH, THIS BOOK IS ON YOUR REQUIRED REFERENCE LIST. Enables herbal enthusiasts and health care professionals to make their own evaluations and to make informed decisions. A REFERENCE TO CONSULT AGAIN AND AGAIN. Varro E. Tyler, PhD, ScD, is a recognized authority on plant drugs (herbs) and their uses. He is the author of over 250 scientific and educational publications, including the bestselling guide to botanicals Herbs of Choice: The Therapeutic Use of Phytomedicinals, also published by Pharmaceutical Products Press.